U.S. troops have captured 34 Iraqis, including 10 wanted for making explosive devices to attack coalition forces, the military said Tuesday. South of Baghdad, a roadside bomb killed three Iraqi National Guardsmen. Soldiers from the 1st Infantry Division detained seven members of a car bomb-making cell Monday evening in As Siniyah, about 150 miles north of Baghdad. Another seven people, including three suspects wanted for making roadside bombs, were captured during raids Monday in Tikrit, Saddam Hussein's hometown, about 80 miles north of Baghdad. During a search of one house, soldiers found three homemade bombs, a weapon that has been used to deadly effect against hundreds of American and Iraqi soldiers since the onset of the war last year. Several hundred U.S. and Iraqi forces arrested 20 suspected militants Sunday in the southern Baghdad district of Rashid following a short firefight, the military said in a statement Tuesday. The New York Times reports that, according to government officials, a classified cable sent by the Central Intelligence Agency's station chief in Baghdad has warned that the situation in Iraq is deteriorating and may not rebound any time soon. The cable, sent late last month as the officer ended a yearlong tour, presented a bleak assessment on matters of politics, economics and security, the officials said. They said its basic conclusions had been echoed in briefings presented by a senior C.I.A. official who recently visited Iraq. The 10th Special Forces group, a unit that includes nearly 1,000 soldiers based in Fort Carson, Colo., has left for Iraq in a secret deployment that occurred during the last few weeks, Army officials have confirmed. Army Special Operations Command, headquartered at Fort Bragg, N.C., refused to specify exactly how many soldiers had deployed from Fort Carson. But The Gazette of Colorado Springs, citing unnamed sources, reported in Tuesday's editions that almost all of the troops from the 10th Group were gone. The 1st Marine Expeditionary Force said three U.S. soldiers were killed Sunday in fighting in western Anbar province, a region that includes the battleground cities of Fallujah and Ramadi. More than 1,270 U.S. troops have died since the Iraq war began in March 2003. Another U.S. Marine assigned to the 1st Marine Expeditionary Force died Tuesday in what the military described as a non-hostile motor vehicle accident in Anbar province. A U.S. Army tank company commander accused of killing a critically injured driver for radical Shiite cleric Muqtada al-Sadr in Iraq will be court martialed, an Army spokesman said Tuesday. In the roadside bombing, the Iraqi National Guardsmen were patrolling an area near Jebala, about 40 miles south of Baghdad, on Monday evening when the attack occurred, an Iraqi National Guard official said on condition of anonymity. The National Guard and other homegrown Iraqi security forces are frequently targeted by insurgents, who accuse them of collaborating with U.S.-led occupation forces. Iraq has seen a wave of attacks in recent days targeting the country's security forces, who tend to have less training than their American counterparts and are thus far more vulnerable. 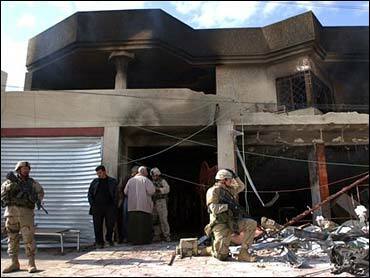 More than 80 Iraqi security force members have been killed since Friday in a series of high-casualty attacks. On Monday, a heavy gunfight broke out on a dangerous street in central Baghdad within blocks of the country's most fortified facilities, including the U.S. Embassy and interim Iraqi government headquarters. Witnesses said gunmen killed an Iraqi employed by coalition authorities on Haifa Street not far from the Green Zone, a heavily guarded compound where American and Iraqi forces protect government officials, diplomats and private contractors. A dawn attack on a domestic oil pipeline supplying fuel from northern Iraq to Baghdad and clashes that killed three militants in the country's turbulent west underlined the security difficulties ahead of Jan. 30 national elections. In Washington, President Bush met Iraq's interim president, Ghazi al-Yawer, and told reporters it was impossible to "guarantee 100 percent security" in Iraq. Mr. Bush pledged the United States would do everything it could to make Iraq's elections as safe as possible. Al-Yawer, a Sunni Muslim, expressed resolve to defeat the insurgents, saying "victory is not only possible, it is a fact." He said most Iraqis want the elections. His White House visit is seen as a way to persuade Iraq's political minorities, comprising mostly Sunni groups, not to boycott the elections. Sunni Muslims represent one-fifth of Iraq's nearly 26 million people and wielded the power under Saddam Hussein. They fear the election will give Shiite Muslims, with 60 percent of the population, an overpowering grip on the nation. U.S. and Iraqi officials are concerned that a boycott by Sunnis could undermine the legitimacy of a new government. Also Tuesday, Australia issued an updated travel warning advising its citizens against going to Iraq, especially ahead of the Jan. 30 elections. The statement urged Australians to take precautions "in light of a significant increase in hostage taking and the likelihood of an increase in terrorist and anti-Government activity in the lead up to the Iraqi elections." "We continue to receive reports that terrorists and anti-government forces are planning attacks against a range of targets, including places frequented by foreigners such as hotels, restaurants and international transport," the statement said. Several countries, including the United States and Britain, have issued similar warnings. More than 100 foreigners have been abducted since the U.S.-led invasion began in March 2003, and many have been killed.